A beautiful eyebrow shape is best done once in the salon, and then independently maintained it - periodically pull out the new hairs and tint. However, if you are all used to doing it yourself, the following tips will be useful to you. 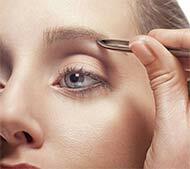 Stand at the big mirror, disinfect the surface of the eyebrows, take tweezers. Lighting should be bright, otherwise the result will be asymmetric. If you have too sensitive skin, you can make a preliminary anesthesia, for example - with a hot compress that opens the pores and hair is easily pulled out. No less effective can be anesthetized plucking eyebrows with ice. Grasp the hair with tweezers as close as possible to the root, pull the skin and pull it out with a sharp movement. Do not rush to pull out a lot of hairs at once, even if your eyebrows are thick. Pull out the hairs alternately from one side, then the other, then look at yourself in the mirror, so you are more likely to get the same result on both sides. At the end of the procedure, treat the eyebrows with a soothing cream or tincture of chamomile, aloe. The correct shape of the eyebrows. The correct shape of the eyebrows is formed on the basis of three vertical lines. 1. To determine the point of the beginning of the eyebrows, draw a line from the wing of the nose to the inner corner of the eye and extend it upwards. From this line, and should begin an ideal eyebrow. All the hairs that go from this line to the bridge of the nose are removed. 2. Determine the point of the end of the eyebrow - we draw a vertical line from the wing of the nose through the outer corner of the eye. At the point where the line crossed the eyebrow and the optimal length of the eyebrow should end. If the eyebrows are too short, they need to be finished. 3. Determine the highest point of the eyebrow. Draw a line from the wing of the nose to the eyebrow, over the edge of the iris of the eye, and the view should be straight. The shape of the eyebrow is corrected at the bottom of the eyebrow. If you pluck a lot of hairs on the upper bend of the eyebrow, the facial expression may change. So, the control points for the shape of your eyebrows are defined. Now remove the extra hairs on the right and left, adjust the shape at the bottom of the eyebrow, make the desired bend.